More than half of all floors in Germany are carpeted, with the exception of hospitals and areas purely used for production and storage purposes. Even hotels and restaurants frequently have carpets. It is considered to look more luxurious and to create a comfortable and cozy ambiance. In the hotel industry, a clean carpet reflects the hotel’s image and improves the well-being of guests. Due to the structure of carpet, it must be cleaned differently than smooth floors; the dirt must be removed not only from the surface but also from deep within the carpet. 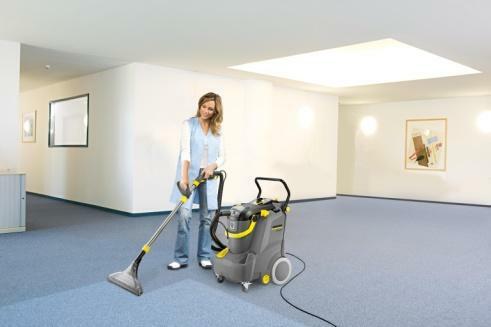 Kärcher has launched a new spray extraction cleaner in the form of the Puzzi 30/4 for cleaning large carpet areas. Its upright design and new floor nozzle are key to this new machine’s exceptional ergonomics and ease of use. Its excellent deep-cleaning capability and efficient extraction make this a highly economical cleaner. The Puzzi 30/4 is ideally suited for use by cleaning contractors and in the hospitality and public service sectors. The new Puzzi 30/4 provides fatigue-free, reliable operation over extended work periods and the floor tool is self-adjusting for maximum performance. Users no longer need to think about holding the floor tool at a perfect angle; the added maneuverability with continuously reliable suction power allows for easy cleaning under tables, around objects and near walls. A clear display for the solution tank also helps promote continuity, as users can plan the next filling process with plenty of notice, saving time and costs. The device is designed to provide a spraying pressure of 4 bar and has a fresh water tank capacity of 30l for an area performance of up to 75m² an hour. Improved flow characteristics in the floor nozzle make for highly efficient extraction and therefore faster drying times, so that carpets can quickly be returned to use. With noise emissions of just 68 db(A), the device is very quiet running, making it highly suited for use in noise-sensitive situations. Thanks to its upright design and the large fixed wheels, the machine is easy to move with minimal exertion; even steps do not present an obstacle. When transporting the Puzzi 30/4 in a van, it can be positioned on its side even with the fresh water tank full. The machine is quickly ready for operation, whereas the additional handle on the vacuum pipe or the height of the carrying handle can be easily adjusted without the need for tools. The fresh water filter and the high-performance particle filter provided to protect users from breathing in aerosols can also be exchanged in a few simple movements. Visit the company website for further product information. Image: The upright design and new floor nozzle are the key to this machine’s exceptional ergonomics and ease of use. Photo: courtesy of Kärcher.